See the other side of Japan with grand vistas, wildness and nature. 1,290 km. 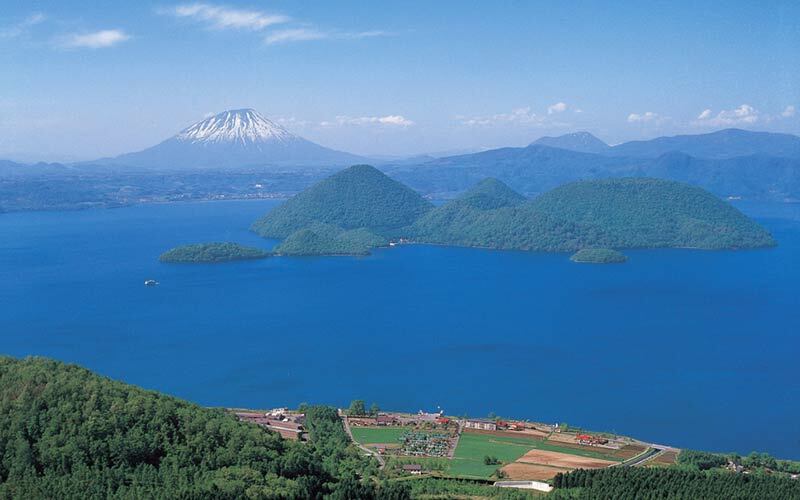 Daisetsuzan, Shiretoko and Lake Akan National Parks. An amazing 9 day road trip that gifts you memories that last a life time. Always drive with caution. Severe (snow, ice and strong wind) weather conditions in autumn, winter and spring. Be aware of wildlife (deer, bear and fox) on road. Campgrounds will be open from May to September. Roadside service areas are open all year. 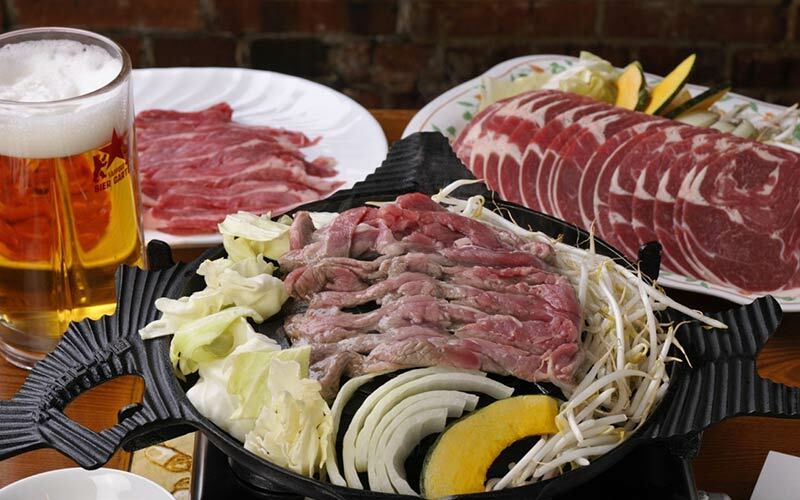 Starting from Chitose Airport or Sapporo head north towards Asahikawa city and Daisetsuzan volcanic national park. 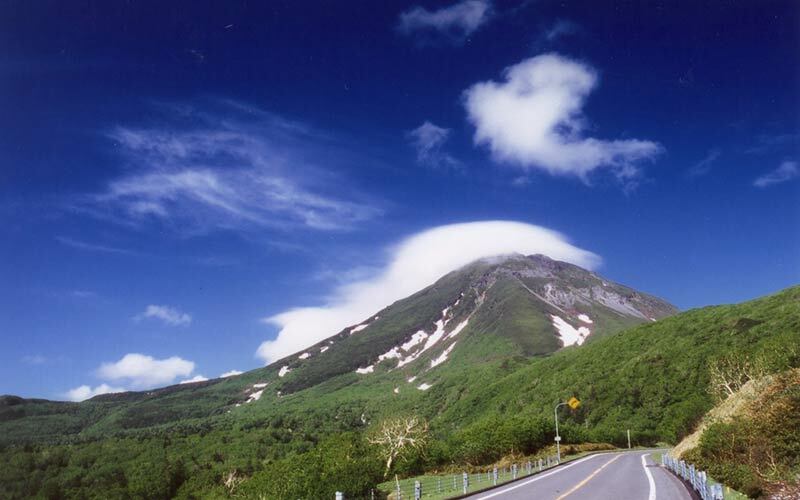 About 2 hours drive is the town of Biei at the foot hills of Tokachidake mountain range. During spring the surrounding area has fields of colourful flowers such as lavenders, sunflowers, poppies, cosmoses and purple salvias. 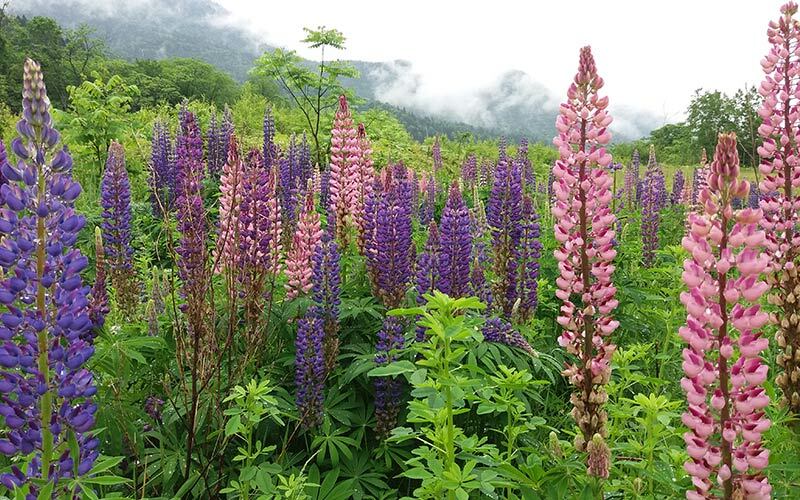 Daisetsuzan national park is Japan’s biggest by area and contains the tallest mountain in Hokkaido, Mt Asahidake . This 2,290 meter high active volcano has a 2 km wide caldera and is accessible by the Asahidake Ropeway. There are spectacular views at the top and moderate to difficult trails up to 2 hours hiking from the top ropeway station. The ropeway operates all year but be aware of changing alpine weather conditions. Nearby Hagoromono Falls (Angels Dance) cascade 270 meters. Stay at nearby autocamp or free parking area for a second night. Driving north and then to the eastern side of Daisetsuzan along Route 39 for 1 hour you will come to Sounkyo Gorge and hot spring resort. The road has towering cliff along the side with impressive water falls Ryusei Falls (shooting star falls) and Ginga Falls (Milky Way falls). From here you can take the Sounkyo Ropeway to the Kuro-dake Lift to 1,700 meters and view Daisetsuzan mountain range again. After crossing the mountain pass continue along Route 39 towards Kitami city. Stop for the evening after 2 hour of driving. Continue 2 hours on through Kitami to Lake Akan and its primeval forest. It is famous for Marimo (moss balls) and sockeye salmon. As it is in the volcanic region, hot springs bubble up along the lake shore. You can take a boat to Chuurui Island. 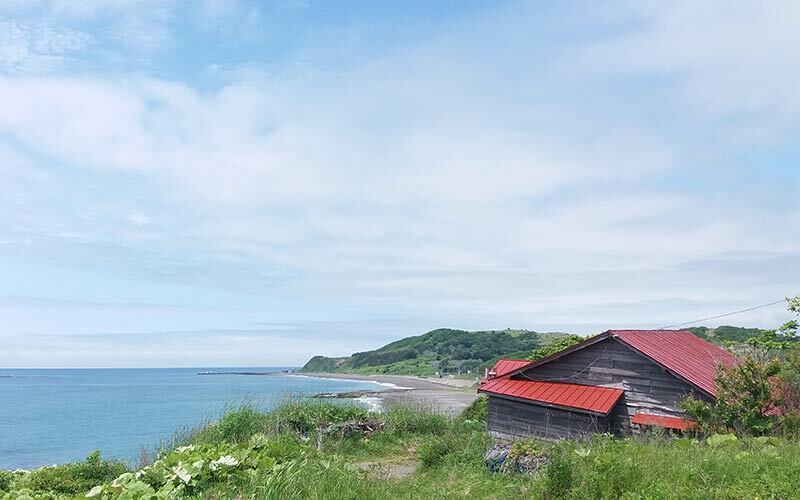 Near the hot spring town, there is the largest Ainu Kotan (village) in Hokkaido. Ainu are the indigenous people of Hokkaido. At the gate is a wood carving of 2 Ainu men and a big owl. Bears, eagles and owls are the god of the mountain for Ainu people. There are 2 museums where traditional Ainu dance is performed and you can learn of the culture and see artefacts. A short drive 40 minute drive away is Lake Masshu. Due to high cliff the lake is only viewable from the top. The water is the clearest in the world at 42 meter underwater visibility and gives a mysterious blue colour. Lake Kussharo. Another 30 minute drive will take you down into the ancient forest surrounding the caldera lake. Enjoy canoeing, fishing or hiking. At Wakoto Peninsula steam still vents from the lake shore and there are natural hot spring bath in the forest. Read more about this amazing region . Take Route 391 past Shari city and then 334 to Utoro city. The gateway to Shiretoko National Park. Make a brief stop on this 2 hour drive at the impressive ocean side water fall named Oshinkoshin Falls. 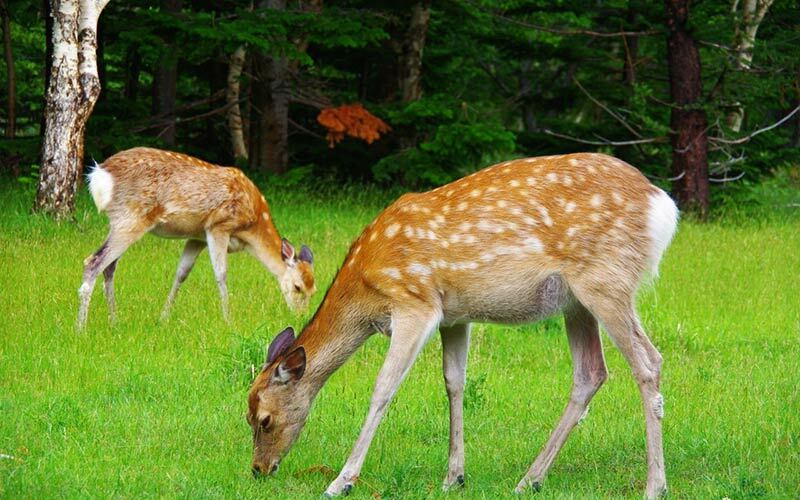 Enter Shiretoko National Park a short drive past Utoro and see wild deer, bears and eagles. This last wilderness has mountain dropping into the sea and many water fall. 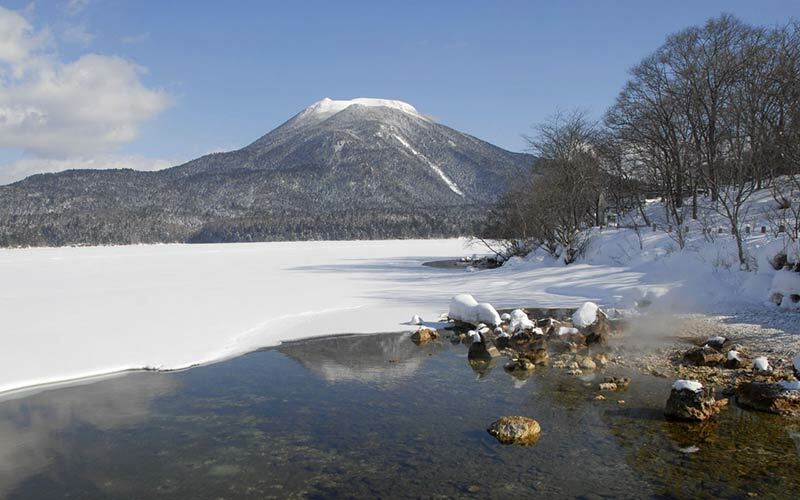 Go for a 1 hour walk around Shiretoko-Goko lakes. (Do not drive along the gravel road past 5 lakes in the camper – its very narrow with low trees). It is a short 45 minute scenic drive across the mountain pass to Rausu. Stop at the top for view of Kunashiri Island ( now Russian territory ). 30 minute drive along the coast from Rausu is Seseki Onsen open hot spring bath. Sit in the ocean as hot water bubbles up around you. Head back through Rausu and south along the coast road Route 335 for 1 hour. After passing through remote fishing villages you will come to Cape Notsuke . This 28 km sand bank arches into Nemuro Strait and is only 16 km from Russian territory. 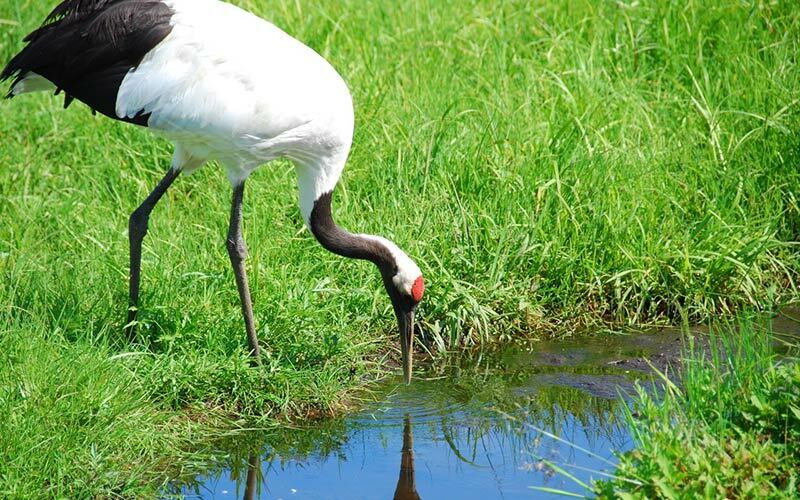 The cape surrounds marshland that is supports many birdlife including the extremely rare Red Crown Crane or Tancho. Wild deer also roam the salt and wind bent forest land on the peninsular. Continue 2 hours south along the coast towards Nemuro city and Cape Nosappu. Stop by Shunkunitai, a long and narrow sandbank which lies between the Sea of Okhotsk and Lake Furen. There is boardwalk for viewing seashores, grasslands, marshes, forests and mudflats. 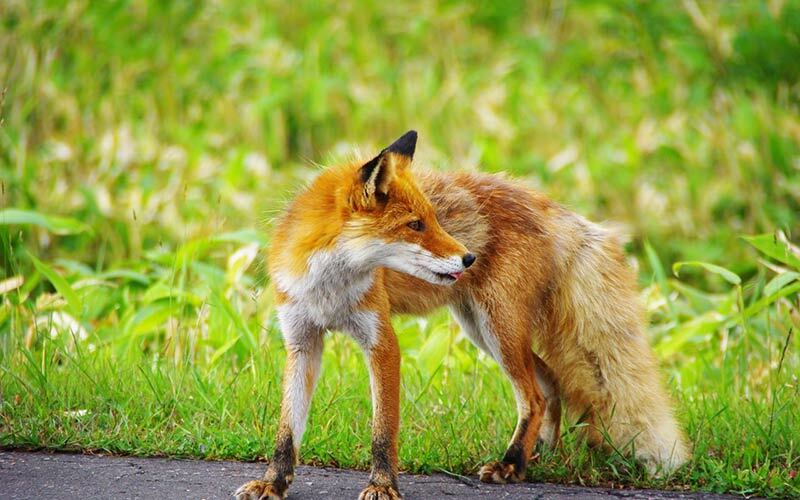 Link to Nemuro City Shunkunitai Primeval Wild Bird Park Nature Center . After visiting Nemuro city it is just 30 minutes to the most Eastern point of Japan, Cape Nosappu . 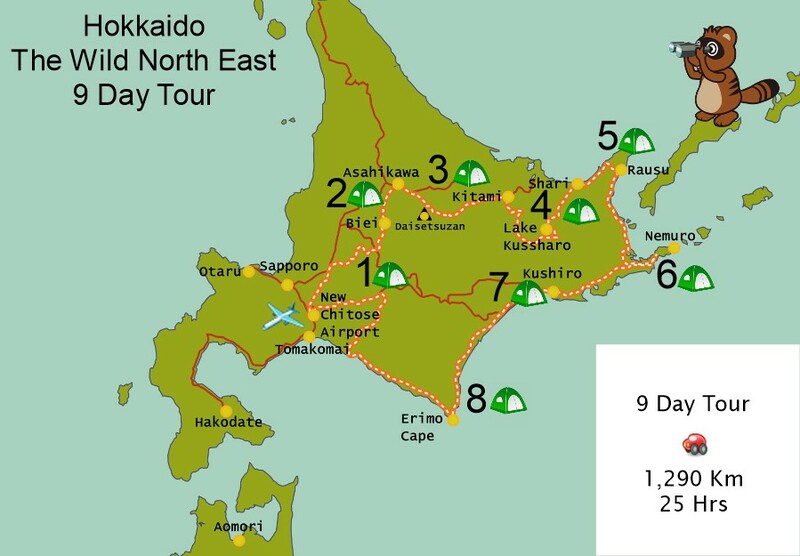 Stay here overnight and be the first in Japan to watch the sunrise. On the cape is the oldest lighthouse in Hokkaido, built in 1872. There is also a 90 meter high observation deck called peace tower with sweeping views. Try local seafood from market in the area and Hanasaki-gani, a small unusual shaped crab. Link to Cape Nosappu, Sasagawa Memorial Peace Tower . Camping and bathing facility are limited in this area but parking overnight in the car park is no problem and there are public toilets. For campsite and bathhouse it is a 1 hour 40 minute drive west along Route 44 at Cape Kiritappu. Continue on Route 44 through Kushiro city on Route 38 to Hiroo city. This 3.5 hour drive follows the coast and you will see many dairy farms along the way. Follow coast road Route 336 to Cape Erimosaki . It’s about a 40 minute scenic drive. Stop at Meguro fishing village along the way and in the river you may see Pacific Salmon spawning. It is possible to fish here too if you have the equipment. Cape Erimo is on the southern tip of the Hidaka mountains and there are 60 meter high cliff into the ocean. The rocks extend several kilometres out to sea and there are seal colony. It is one of the windiest places in Japan and there is a wind museum where you can experience wind of 25 meter per second. Link to Cape Erimo Wind Museum . Continue north west along Route 336 and then Route 235 towards Tomakomai and Chitose Airport. This 3 hour coastal journey will take you through fishing villages and surf beach. 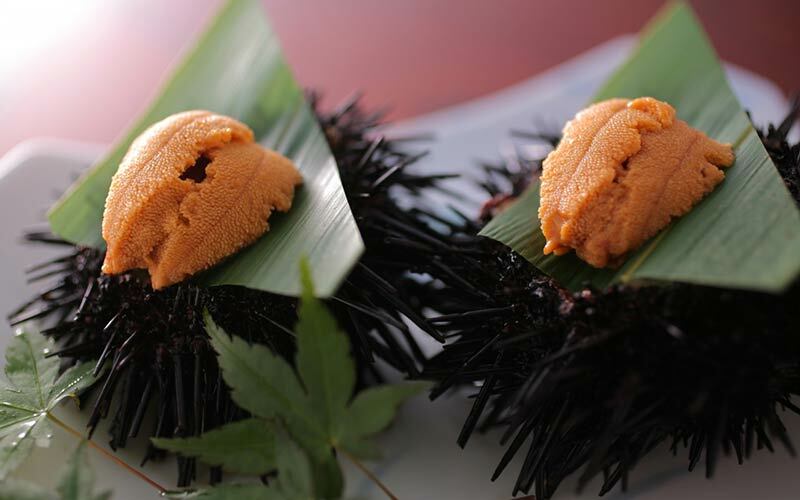 Stop and eat freshly caught seafood including “Uni” sea urchin sashimi which is a Japanese delicacy. Mitsuishi Seaside Park is an ideal resting point or if doing this journey in reverse is a good place to stay on the first night as it is only 2 hours from Chitose. Reflect on an amazing journey and share the experience with you friends!